Dinnertime just got a whole lot easier! 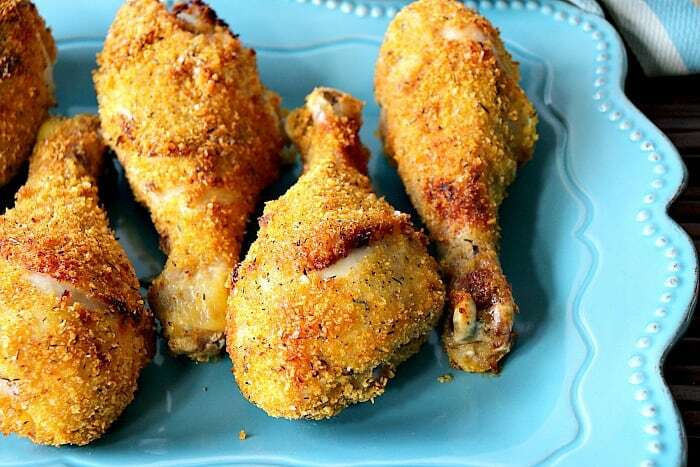 Air Fryer Chicken Drumsticks are coated with cornflake crumbs and seasonings. Then they’re air fried to crispy, crunchy, perfection! In less than 30 minutes you’ll be sitting down to a delicious meal! Even if you’re new to cooking, or nervous in the kitchen, you will be completely successful with this easy to follow and foolproof recipe for air fryer drumsticks! 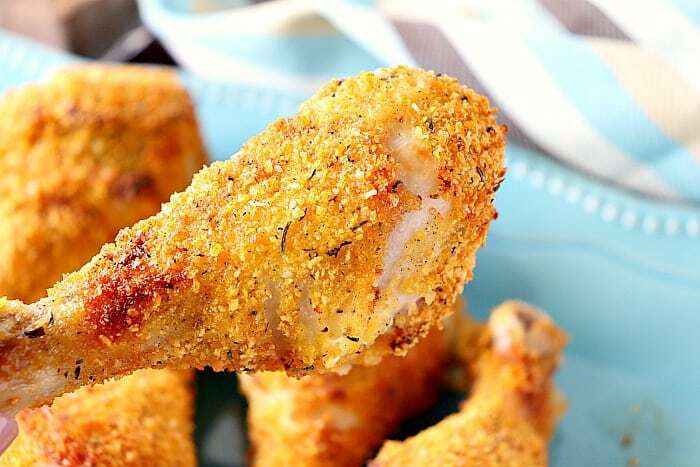 If you can brush chicken drumsticks with mayonnaise and toss them with crushed cornflakes then you’re going to love this recipe! I guarantee it! **Please Note – The printable recipe card with detailed instructions, complete ingredient measurements, and nutritional information for making Air Fryer Chicken Drumsticks is available near the end of this post. How many chicken drumsticks does this recipe make? I made 12 chicken drumsticks with this recipe (two batches). But you can easily double, or cut the recipe in half, if needed. Once made, these air fryer chicken drumsticks are super easy to grab for an on-the-go lunch or even quicker dinner when time is extra tight. They’re tasty reheated or even eaten cold for in a school lunch box, or packed up for a picnic. Stir together the Greek yogurt, milk, salt, and pepper until creamy. Brush the yogurt mixture evenly over each chicken leg. In a medium bowl stir together the cornflakes, ground thyme, ground sage, garlic powder, remaining salt, and pepper. 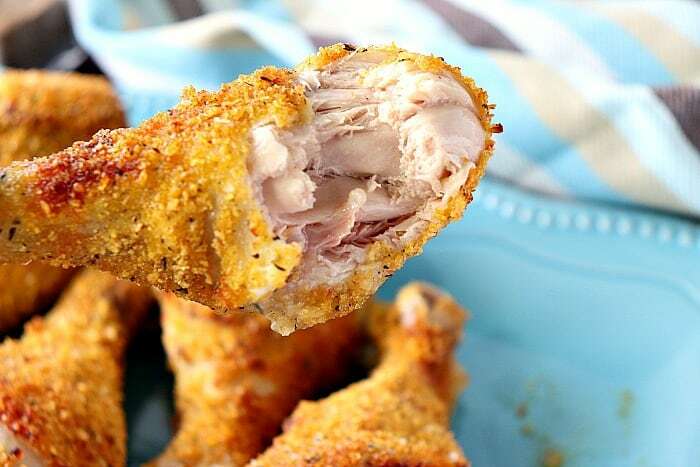 Coat each mayonnaise coated chicken leg evenly with the cornflake crumbs. 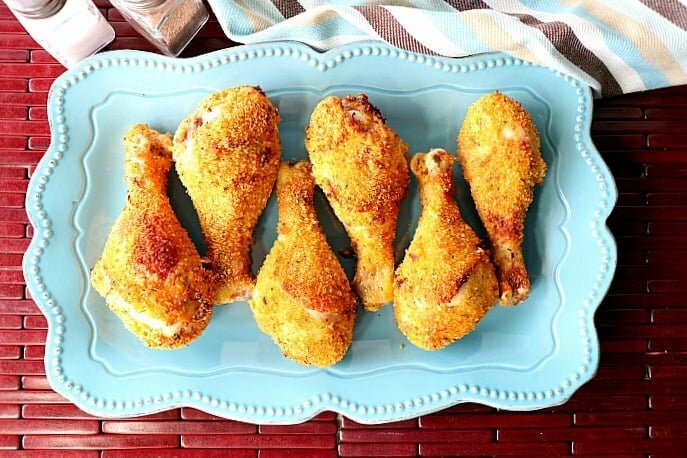 Place 6 drumsticks into the air fryer and spray with a light touch of olive oil spray. Set to 375-degrees for 15 minutes. After 15 minutes pierce one of the biggest chicken drumsticks with a skewer. If the juices run clear (with no pink), the chicken is cooked through. OR test with a meat thermometer for an internal temperature of 165-degrees Fahrenheit. If the juices run pink return the chicken to the air fryer to cook for an additional 4-5 minutes. Continue the same process with the remaining 6 drumsticks. Do I have to use drumsticks for this recipe? No. You can use whatever cut of chicken you prefer. Just make sure to adjust the cooking time accordingly. Chicken with bones takes longer to cook than chicken without bones. Dark meat takes longer to cook than light meat. What is the proper internal temperature for cooking chicken? For white meat, the proper internal temperature is 160-degrees Fahrenheit. For dark meat, the proper internal temperature is 165-degrees Fahrenheit. What if I don’t have a meat thermometer? A good way to test if chicken is cooked through is to pierce it in the thickest part with a knife or skewer. If the juices run clear, with no pinkish tinge, then it’s cooked through. Or, give the chicken a little slice with a sharp knife (through to the center) and if it’s completely opaque, it’s cooked. Does an air fryer require any oil at all? If I’m going to be totally honest, I’ve not used my air fryer without any oil, although I’m sure you can. However, the oil I do use is minimal. I’ve only been using a light spray on the things I’m cooking. So far I’ve used an olive oil spray, and grapeseed oil spray, but there are so many other spray oils to choose from which will also be perfect for the air fryer. Is an air fryer an important kitchen appliance? An air fryer is an appliance I didn’t know I needed until I received one as a gift. Now I’m using it non-stop, and sometimes even twice a day! If an air fryer can take the guesswork out of cooking, and turn out perfectly browned meats, perfectly roasted vegetables, as well as delicious fried foods (but without all the oil), then why wouldn’t you want to add it to your kitchen appliance wishlist? 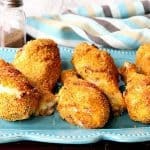 **The following affiliate links are some suggested products I’ve chosen that will aid you in the making and serving of this recipe for Foolproof Air Fryer Chicken Drumsticks if needed. Below is the printable recipe card for today’s Air Fryer Chicken Drumstick Recipe. 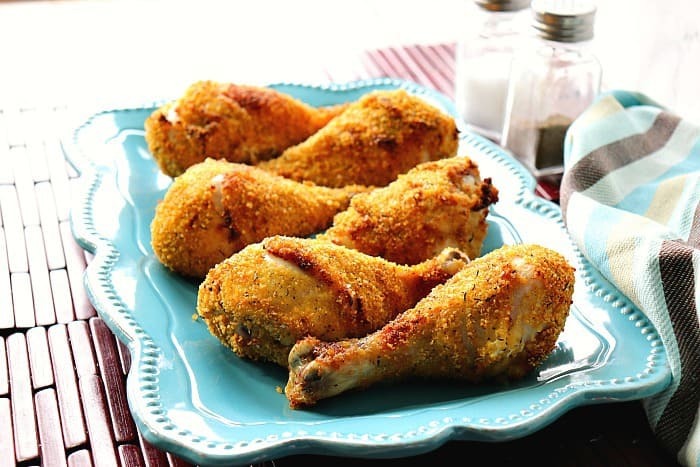 Air Fryer Chicken Drumsticks are coated with cornflake crumbs and seasonings. Then they're air fried to crispy, crunchy, perfection! In less than 30 minutes you'll be sitting down to a delicious meal! In a small bowl, mix together the yogurt, 1 teaspoon salt, ½ teaspoon pepper, and the milk until creamy. Brush each chicken leg with the yogurt mixture on all sides. Set aside. Add the cornflakes, remaining salt, remaining pepper, thyme, sage, and garlic powder into a medium bowl. Coat each chicken leg evenly with the cornflake crumb mixture. Add 6 of the chicken legs to the air fryer and spray sparingly with olive oil spray. Close the fryer and set the temperature to 375-degrees, and set the time for 15 minutes. After 15 minutes, check the chicken for doneness and to make sure the juices run clear. If not, return the chicken to the fryer and cook for an additional 5 minutes (if needed). I sincerely hope you’ve enjoyed today’s recipe for foolproof air fryer chicken drumsticks as much as I’ve enjoyed bringing it to you! I think I need to borrow my friend’s air fryer now! Awesome recipe and I cannot wait to try it!! If you can swing it, get an air fryer of your own. You’ll use it all the time! Oooh… I also just got an airfryer as a gift and I’ve been on the lookout for things to try with it! I can’t wait to give this a go. It sounds wonderful! I love my new air fryer! You’ll love yours too, and you’ll also love this recipe. Enjoy, Stef! The air fryer is so much fun and I love that it makes tasty recipes a little more healthy! Definitely one of my favorite appliances. That coating looks amazing! I love that you can use minimal oil to get results like this. I have had my eye on an air fryer, now I’m convinced I need one now! I’m loving my air fryer and I recommend one. It will be a much-used appliance in my kitchen, and probably yours. I try this recipe and it took at least double the time to cook all the way through, but like waaay longer 15min after 15min after 15min. So disappointed because it looked very appealing and yummy but at the end the outside was almost burning. It wasn’t a success. The only I can think of, is that My air fryer is smaller I can only fit 3 drumsticks at a time. I don’t know if that would make a difference.